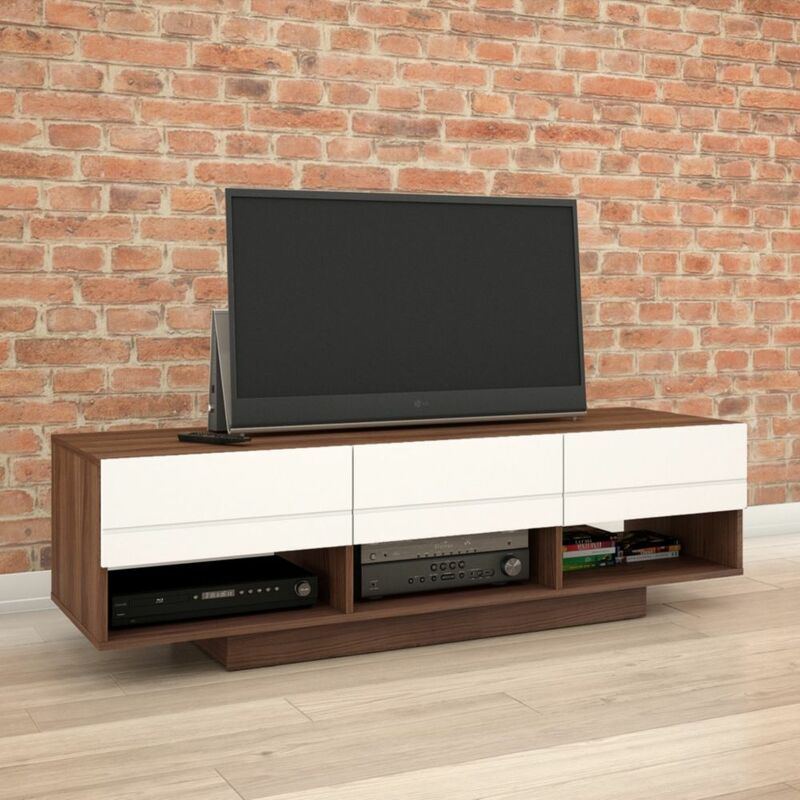 Fit any floor plan and space with this Nexera TV stand. The walnut free standing TV stand can hold a television up to 51-inch to 60-inch. Use this piece as a handy place to store movies, gaming consoles, and even speakers. Entertaining never looked this good. Edgy, cool, and rustic tones couple with a touch of industrial modern flair, is why the Essence TV Stand is a must have. Simple design and minimalism at its best, the Essence stand is functional without overwhelming in detail or added parts. An open concept, a lower cubby offers space for a DVD player, record player, standing gaming system or router. An open lower level can hold books, media accessories, favorite movies, or prized records. Add a television, interesting plants, framed photos, or colorful vases to its base, and it instantly centers a space. Ideal for small spaces, this sleek cappuccino corner TV stand is angled to fit snugly into a corner or against any wall in your home. Featuring a center shelf for electronic components and an additional bottom shelf for DVDs, sound bars and other AV accessories this stand is sure to keep you organized in style. With ample surface area finished in a warm cappuccino this piece accommodates up to a 40" flat panel TV. Add a touch of style to your entertainment room with this contemporary TV stand. The large bottom shelf will accommodate your audio visual components, gaming accessories,books or decorative objects. Finished in a sophisticated grey, this versatile TV stand can be placed in a living room, guest room, den, or basement and is perfect for small homes. Accommodates all TV sizes with a center stand. This 48" long TV console will be a fashionable addition to your living room, offering clean lines and ample storage space. The transitional/contemporary style TV stand has a rich cappuccino finish with a wide surface for your television. Three open shelves in the center (2 which are adjustable), with wire management holes down the back, are ideal for placing electronic components. The handy side shelves are great to store movies, games, or decorative pieces. For a perfect finishing touch, this lovely piece is completed with tapered legs, and will blend effortlessly with any decor. Nexera Sequence 59.75-inch x 17.25-inch x 18.75-inch TV Stand in Walnut Fit any floor plan and space with this Nexera TV stand. The walnut free standing TV stand can hold a television up to 51-inch to 60-inch. Use this piece as a handy place to store movies, gaming consoles, and even speakers.